She woke up every morning with a hundred voices in her head, all speaking at once. Washed her face with cold water. It made her feel alive. Pushed the chaos aside and stood in front of the mirror. She had mastered the art of make believe over the years. 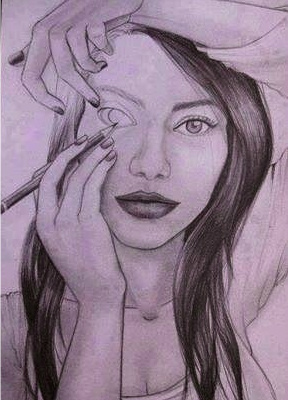 She could now draw the face she wanted to show the world in an instant. Drawing the arcs of her lips first, in the shape of a perfect smile. Filling them with happy colors. A dash of blush on her pale cheeks to add to the effect. Finally reaching the eyes, filling them to the brim with kohl, hiding all that they threatened to reveal.She was now ready to let the world face her.